This special Welfare Rights feature was inspired by discussions with people attempting to navigate the welfare system and has been developed by co-editor Ria Dylan and Danny Taggart. 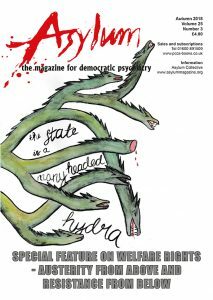 Asylum 25.3 presents a series of articles that reflect the despair, illness and worse that people have suffered as a result of the unprecedented governmental attack upon disabled people in the UK in the previous decade. It also documents examples of how this bureaucratic onslaught has been, and continues to be, resisted by disabled people, their communities and allies. This issue also includes an article by Akiko Hart on debates around diagnosis in mental health, published earlier this month as our ‘preview’ article; Liam Kirk’s piece on low paid workers in the NHS; Patrick Wood’s reflection on the history and current state of the mental health service user/survivor movement; news about the campaign to end mechanical restraint in Spain, along with letters, creative writing, news and reports. We are on a drive to get Asylum magazine in to more libraries. 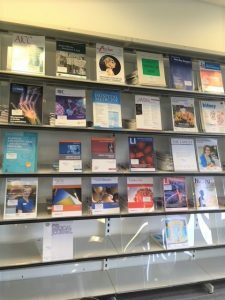 Here it is in the Robertson Trust Medical Library at Ninewells Hospital in Dundee. Can you recommend Asylum to another library? Please pass the word around.